The countdown to racing season has begun for athletes in the Northern Hemisphere, however, some of you might not be feeling quite ready to toe the line. Do you have that uncertain feeling in your gut that your winter training hasn’t gotten you prepared for your early IRONMAN 70.3 races? If so, now is the time to complete some IRONMAN 70.3 brick workouts in order to properly assess your fitness. This IRONMAN 70.3 brick workout is abbreviated as it is mostly indoors, but it is still challenging. It begins with a tough, race-pace swim, followed by a run, then an indoor bike session and finally another run leg. Ideally you will be able to transition from the swim portion to the first run section as quickly as possible to simulate race conditions, but anytime within one hour is acceptable. 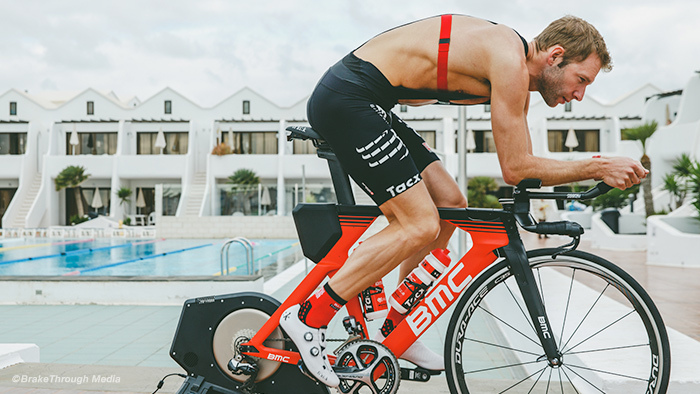 Since the bike portion is done indoors, you could ideally have your trainer set up either next to the treadmill or at the finish point of your first run to officiate quick transitions. I recommend doing this workout at as close to 70.3 intensity as possible. Your goal is to achieve the 70.3-style effort of a 1.2 mile swim, knowing you still have a solid bike and run effort in front of you. *If you have the opportunity to make this an outdoor workout, you can modify it with 10 to 11 miles of running and 50 to 55 miles on the bike, helping you achieve combined mileage closer to the IRONMAN 70.3 distance. Don’t despair if you feel as though you can’t hit your goal numbers on the bike or run the first time around. The reason that we train and try race simulation workouts is so we can be prepared on race day. Learning from hard workouts, like this one, is how we improve and understand our limiters. The key to long distance racing is pacing and nutrition, so keep working on your objectives and keep striving to hit your goals. Mark your calendar to try this race simulation workout and let me know if you have any questions. Good luck! Interested in some other workouts to get you ready to race? Get a boost in your training with this FREE D3 Multisport four-week training plan, completely based on power, heart rate and TSS.